Every major holiday seems to require presents, and those presents require wrapping, whether they’re birthday, Christmas, Valentine’s Day or even Easter presents. Wrapping paper is definitely a commodity, and so it follows that gift wrap fundraisers are great fundraisers for an organization to host, since the item is very popular. The profit margin is good on this fundraiser, so you should stand to make some money from this if you time it right and have good sales people. Gift wrap fundraisers work as a brochure sale. Once you choose a gift wrap fundraiser company, they will ship you a brochure detailing their gift wrap choices. Often, the brochures will be shipped for free or for a small fee. Once you’ve gotten your brochures, your participants will take them around to potential customers and collect the money upfront. Sometimes, gift wrap companies will include a small sample of the gift wrap so that your customers can see and feel it before they buy. This may increase sales, so you may want to choose a company that does this. You may want to hold your sales period shortly before Christmas for the best results – everyone needs Christmas wrapping paper. Once you’ve collected all of your orders and money, you’ll need to tabulate the orders and then place one large order with the company. The great thing about this fundraiser is that you’ll get to keep your profit right away. Shipping should take a few weeks, so make sure to finish your sales period at least 4 or 5 weeks before the holiday. Shipping may be extra with some companies, so see if you need to reach a certain sales level to get free shipping or a higher profit level. Some companies may also require you to place a minimum order, so make sure you sell up to this level if you don’t want to carry an inventory. When the paper arrives, you may need volunteers to help you to sort it and deliver it. Some companies may pre-sort the order for you, however. You should also see if this will cost you extra, because it may eat into your profit. 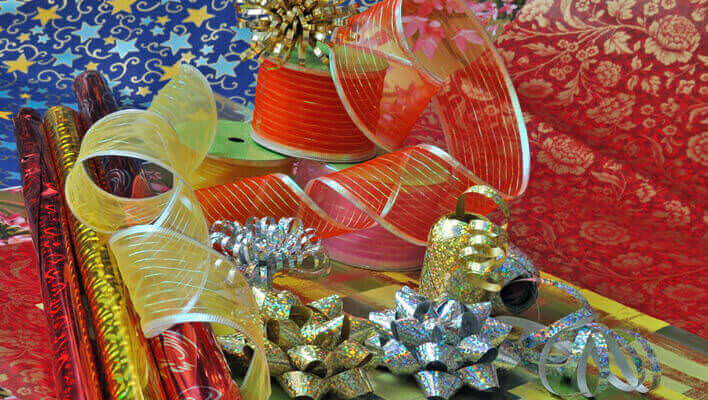 Gift wrap fundraisers normally have a profit margin of 30% to 50%, more if you have good sales. This fundraiser works well in a school setting, because most parents will be happy to support their child’s school, and they may also elicit other sales from their friends and family by word-of-mouth. Be sure you know much you’ll have to pay upfront for things like shipping, as this can eat into the profit that you make. Make sure to allow plenty of time for delivery so that your customers can have their paper when they need it. Also stress to your group that you will need help to sort the orders if the company won’t do it for you. Although gift wrap fundraisers are popular and easy to do, they do have their pros and cons. A good thing about them is that they’re a popular item, and everyone needs gift wrap, so it’s easy to host these fundraisers year after year around the same time. Also, if people know that you’re going to be hosting a gift wrap fundraiser, they may plan to buy their paper from you. This is an easy fundraiser for any age group to put on, and likely you’ll find that people will be interested in buying from you. Remember, however, that if you’re going to send young children door-to-door, you need to put security measures into place, like chaperoning or organizing the children into groups. Sometimes, it’s better not to send them door-to-door at all, so carefully consider this before deciding on your sales plan. The cons of a gift wrap fundraiser are that because it’s a popular item, other groups in your area may be putting on the same fundraiser, and the local retailers may have the same gift wrap for cheaper, so you’ll have to stress the needs of your group to get sales. As well, timing is critical when you host a gift wrap fundraiser – too early, and people won’t want to buy because they’re not in the holiday spirit (and some people don’t like Christmas things being offered to them too early in the season); too late and the gift wrap won’t arrive in time for the holiday. If you have the timing just right, a gift wrap fundraiser can raise a lot of money for your group. The key is in advertising and great sales people. You will have to stress to your participants the importance of selling for charity. If the company you’re working with offers an incentive for good sales, you should implement this to motivate your participants more.